One of my favourite TV shows is the BBC series, “Grand Designs”. In each episode the presenter, an architect himself, meets an individual or a couple who are embarking on a project to turn a run down property into an architectural masterpiece. Each couple have a grand design in mind for their new home. They’ve got plans and a budget and time scale they believe is achievable. Thing is, it rarely works out the way they plan and invariably the couple have to make a plan to fix something that doesn’t work, find extra money and live in caravan for a lot longer than they thought. I guess what I like about it is that reminds me a lot of myself. I often set out to live my life with a grand design in mind. In my late teens I decided my plan would be to be get married in my early twenties, have kids in my mid twenties and live happily ever after in my late twenties. But none of that really went to my plan but it did go to God’s plan. Proverbs 19 that says we can plan and budget and predict but at the end of the day God is in control and what he wants to happen will happen. 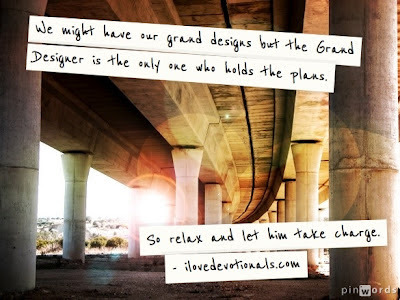 We might have our grand designs but the Grand Designer is the only one who holds the plans. So next time you're worrying about how your plans will work out, stop, breathe and remember that you play your part but ultimately God's plan will prevail - so relax and let him take charge. He knows what he is doing with your life. Can you think of time when your plans didn’t work out but from the ashes of your dreams God made his plan clear? Pray and ask God to let his plan prevail in your life today.